WHAT IS PAWS' STAND ON PET SHOPS? PAWS advocates the adoption of animals from an animal shelter or animal welfare org or pound versus the purchase of an animal from a breeder or a pet shop. Pet shops are the primary customers of puppy mills and irresponsible breeders who do not care about the welfare or conditions of the animal, but rather the profit they can get out of using the animals. If the individual chooses to buy a specific breed of dog, we encourage him to seek out reputable breeders dedicated to improving the health, condition and behavior of their animals. -- Please do a search online on HOW TO IDENTIFY A RESPONSIBLE ETHICAL BREEDER. A responsible breeder will have their dogs and their breed's welfare in mind. They do not breed for monetary gain or status. A responsible breeder gives importance not just to physical qualities (looks and structure) but also to temperament (behavior) and health. They realize that there is more to breeding than putting 2 cute dogs together. -- For example, aggression is hereditary and a responsible breeder would not breed a dog with aggressive traits because this can be passed on to the puppies. -- Purebreeds are predisposed to certain diseases that may or may not be inherited (i.e., hip dysplasia, hernias, mange, etc.) - responsible breeders make sure to test for these or rule these out before breeding and will inform the buyer about these concerns. A responsible breeder would not sell their puppies online or to pet shops, nor would they do a rush sale and release the puppy into the hands of the buyer on the same day that the buyer looks at the puppy. We hope potential pet owners and those looking to buy pets understand that as an animal welfare organization that espouses shelter/pound adoption as first option to pet ownership, we don't encourage retail pet trade in the first place. We advise those who insist on patronizing breeders to be proactive enough to make the effort of doing their own homework and research, use prudent judgement and most of all, contact the proper official groups/organizations concerned with breeder registrations such as PCCI and AKCUPI - instead of asking for referrals from an animal welfare org that is striving to foster a society that adopts rather than breeds or buys, that seeks to eliminate breed-mentality so that the hundreds of ASPINS who comprise the majority of victims (of neglect, cruelty, homelessness, abandonment and slaughter and meat trade) get a fair chance at being appreciated, loved and adopted. PAWS focuses on animal welfare efforts. We have received too many reports complaining about raw deals with breeders (claimed as vaccinated but had parvo or distemper after, or puppies seemingly healthy but are discovered to have underlying illnesses after a vet visit, breeders/pet shops not returning their calls, etc). Know that fraudulent business practices are not under scope of animal welfare unless the complainant's concern is neglect or cruelty. PAWS opposes “puppy mills,” facilities and individuals who mass-produce puppies to sell them on side walk, to produce them for the pet shop industry, for Internet sales, or for other retail purposes. Puppy mills suffer from poor oversight, control, and regulation. Ill health, genetic defects and/or negative behavior traits are often overlooked in favor of financial profit. The same goes for irresponsible breeders - whether they are small time or big time. The dogs used for breeding purposes are often insufficiently cared for, inhumanely housed, and lacking adequate veterinary care. Buying a puppy out of pity from a pet shop or a puppy mill will not help because these unscrupulous breeders will already have replacements for them. The best thing to do is not to buy from them. Consider adoption as your first option. PAWS approves the keeping of companion animals only when there is full personal commitment to the welfare of the animals. The animals must be provided with shelter, exercise, care, food and water and vet care appropriate to their physiological and behavioral needs. We believe that spaying or neutering of a companion animal is part and parcel of responsible pet ownership and is crucial to preventing animal homelessness and cruelty. Pet shops are notorious for selling unhealthy puppies, and they may or may not provide valid vaccinations. Please note: only licensed veterinarians should administer vaccinations. The sticker/label of the vaccine must be on the health record along with the signature, license # and PTR # of the veterinarian who administered the vaccinations. Complaints about pet shops can be directed to the Bureau of Animal Industry (BAI) - Animal Welfare Division (tel. # 928-2837 or 924-7951) as pet shops are under the bureau's jurisdiction. BAI is responsible for issuing issue certificates of registration to pet shops yearly if said establishment is adequate, clean, safe and sanitary and will not be used for nor cause pain and/or suffering to the animals - as mentioned in RA8485 The Animal Welfare Act. BAI can revoke or cancel the certificate of registration if the establishment fails to observe these conditions. Aside from the description of the situation/circumstances witnessed at the pet shop, please make sure to provide the business name of the pet shop, the address and if possible, the owner's name. Please copy furnish PAWS at philpaws@yahoo.com when you submit your complaint to BAI. The Animal Welfare Division is tasked to implement the Animal Welfare Act with the objective of protecting and promoting the welfare of animals in the country by supervising and regulating the establishment and operation of all facilities used for breeding, maintaining, keeping, treating or training animals either as objects of trade or as household pets. Under the said act, all animal facilities should secure a certificate of registration from the Bureau of Animal Industry. Further inquiries in relation to this can be obtained by calling (02) 924-79-51 or visiting the Animal Welfare Division, Bureau of Animal Industry, Visayas Ave. Diliman, Quezon City. Pet shops, puppy millers and irresponsible breeders (including those who sell online) do not care about the animal's welfare and prioritize profit from the animals (selling to anyone who can afford) instead of placing them in good forever homes. These puppies/kittens often grow up and the owner realizes he/she no longer wants them because a) they are no longer cute, b) they are becoming too expensive to care for, or c) to care for them takes up too much time and effort. These pets end up unwanted and neglected, or given away by the owner who does not understand or give importance to responsible pet ownership - and PAWS has talked to a lot of these pet owners who have wanted to leave/abandon their pets at PAWS. PAWS has also received a lot of complaints from pet owners who bought their pets from irresponsible breeders and pet shops. IS IT LEGAL TO SELL PUPPIES/KITTENS IN THE STREETS? I was wondering if your organization is active all over the Philippines and if its within your capacity to address situation concerning puppy mills. There are puppy peddlers in Alabang Muntinlupa, Divisoria and in Subic (i saw once) and the puppies are inside basket cages. I was wondering if you are aware of this business and if it is legal. They sell this puppies from P500-P800 a piece and they would say they are part labrador or retriever which is hard to believe and is obviously lies. I pity the puppies on how they are handled by these peddlers and on the way they look (tired, in-active) and sometimes i even wonder if they are being fed while they are being carried all around the whole day. I once got curious and asked some of these peddlers where they got those puppies, most of them are evading my questions by saying it was just given to them for them to sell or they would say somebody else drops them nearby to sell them. One time a middle age lady selling puppies said they get them from Laguna. I believe there are puppy mills here in the Philippines and we don't know how animals are treated on those mills but i fear the worst. I am curious to know what is the stand of PAWS on this matter. Puppy mills, irresponsible breeders and pet shops admittedly is a huge animal welfare issue - which PAWS currently fights through educational campaigns informing people why they should not buy from these shops. If there is no one who will buy, these "businesses" will ultimately close down - that is the long term goal. It is indeed sad and horrifying to be confronted with so much animal cruelty places like puppy peddlers on the streets, Cartimar, Arranque, Tiendesitas, etc. as well as the reality that we do have puppy millers and irresponsible breeders here in the Philippines. The puppy mills may not be as big or established as the puppy mills in the US but they do exist, unfortunately. You even see a lot of the small time irresponsible breeders online in the forums, sulit, Facebook, etc. Regarding puppy peddlers on the streets like Alabang, Muntinlupa, Divisoria, etc. - It is illegal to sell dogs/pups on the streets. They don't have permits from the local government nor from the Animal Welfare Division of BAI. 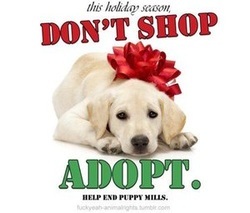 If you see them, please don't buy (and tell your friends and family not to buy as well) -- buying will only encourage these people to continue breeding and selling. It is possible that these dogs for sale are not only from puppy mills and irresponsible breeders, some of them may have been stolen as well. If you see them selling on the streets, please report them to your LGU and the BAI-AWD and copy furnish PAWS at philpaws@yahoo.com. Photos would definitely help but we also advise people to be mindful of their safety in case these peddlers and offenders react in a negative way. Please help us spread the word to avoid buying a pet from pet shops, puppy mills and irresponsible breeders. Animal welfare groups like PAWS write letters to the mall administrators and the Animal Welfare Division of BAI but, ultimately, we have learned that we have to campaign at the Senate and in Congress to amend our laws in order to approach this issue in a strategic manner. Awareness through the media and social networks also help. The cruelty of pet shops and the illegal wildlife trade is one of the things we intend to tackle in our future campaigns. What we advise volunteers in the meantime is to campaign actively with all people not to patronize pet shops who sell live animals, write letters and gather the ff. info for stores that subject the animals to inhumane conditions: name of store, name of owner of store, cruelties observed (dates and time) and photos/videos. The Bottomline: ADOPT. DON'T SHOP. Contact animal welfare groups who have several dogs and cats waiting for their forever homes.